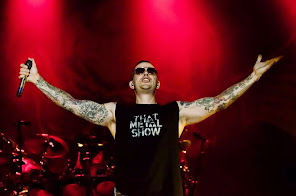 Avenged Sevenfold News: M.Shadows: "We came up with the idea while we were writing the Hail to the King album, and..."
M.Shadows: "We came up with the idea while we were writing the Hail to the King album, and..."
How did you fit it in around your activities with the band? We came up with the idea while we were writing the Hail to the King album, and then we had months off at a time where I could focus on the game. Matt and Michael would work on it six days a week, and I’d come in three days a week. And then when we were on tour, I’d get them to send out builds to me. Then I’d tell them what was wrong, what we needed to fix. Did anything surprise you about the experience and the development process? One of the things that I learned was simpler mechanics and a simpler game can sometimes be more fun. Having a lot of cutscenes and the movie-like hand-holding experiences you get from games these days – especially the triple-A – is not really something I personally want. For me, it’s all about having a great idea first. We were almost playing a game of Jenga at one point, because we started with a simple game but as we kept going, we kept adding and adding – that’s not a good way to design a game. You’re going to cause you a lot of problems, because if you’re changing a year into development, it causes a lot of other problems.